October 31st is Bat Day at Disney’s Animal Kingdom, but that doesn’t mean the celebration has to wait to October to get the party started. Last week a new cupcake flew into the park just in time for the celebration. This batty creation can be found in the Discovery Island area of the park at Safari Coffee, the coffee and pastry kiosk near Disney Outfitters. It is a chocolate cupcake, with cream cheese frosting, chocolate sprinkles, and a dark chocolate bat lollipop. The bat pop is so large that the cupcake is actually served in a cup so that it doesn’t topple over and ruin your entire dessert. If there is one word for this cupcake, it is rich. From the dark chocolate bat to the cream cheese frosting, the components of this cupcake will continually send you for a beverage to cleanse your palate before you dive back in for more. The cream cheese frosting is very smooth, and is easily my favorite part of the cupcake. The chocolate cake itself is moist and a great vehicle for the frosting and bat lollipop. Attaching pops to the top of cupcakes has become a tradition in recent cupcakes from Disney’s Animal Kingdom, from the White Elephant to the Cottontop Tamarin, but this one really takes the cake. It is huge and very thick, to the point where I barely got through a single wing myself. While dark chocolate is not my favorite, I can see dark chocolate fans being in heaven with this cupcake topper! It may not seem as fancy as some of the cupcakes we’ve seen in recent years, but the beauty of this batastic cupcake is in its simplicity. For those of you taking part in the Cupcake Crawl from AJ Wolfe and The Disney Food Blog, this may be off the beaten path, but it should also be right up your alley! So it's literally a cup cake -- Alton Brown would be so all over this! :) I'd buy one just for the dark chocolate bat. 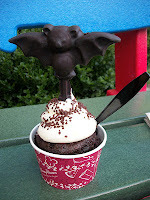 Rich - The bat, even though I'm not a dark chocolate fan, is definitely the reason to buy the cupcake. And I loved that it was so heavy they were scared it would fall over, so they put it in a cup!